As I wandered through the lanes of the flower market the other day, peace and calmness claimed me automatically and this mind of mine that usually runs in tandem with the insane pace of life in HK, slowed unconsciously. I strolled along the many lanes of the flower market, taking in the sheer vibrancy of the flowers and revelled to the fullest possible extent in the joy and the uplifting feeling that flowers bring to the heart. The normal canvas of life in HK which is usually muted predominantly by earth colours, took on a liveliness as the many different hues and tints sprang to life. Streaks of colour splashed across my vision, playing hide and seek as one colour was replaced by another, time and again. Drops of water on the petals and leaves seemingly winked at the bright rays of the sun and magic danced just about everywhere that my sight focused on. Even the periphery of my vision was soaked in a whole range of colours. The only sounds I heard were the buzzing of the busy little bees as they courted one flower after another, seeking sweet nectar. My mind ceased to register the sounds of the vehicles driving past, they failed to register the buzz of human conversation that filled the air around. The air I inhaled was filled with the fragrances that only fresh flowers are endowed with. It was while I was sauntering along the flower market lanes with a happy smile plastered on my face, that my thoughts automatically went tumbling down memory lane. Thoughts that took me back to the colourful festival of Onam. How different it was when we were kids, was my first thought. Our childhood days had never seen us go shopping for flowers on Onam. There were plenty of flowering plants and shrubs within our building compound and they used to sport one of those bald looks on days like Onam. Well, they did sport a bald look most of the days as hordes of grandmothers (my grandmother was totally notorious in this respect) descended upon them without any mercy or pity. There would be no room for clemency, even if the plants were to beg for some. Flowers would not get to see the sunrays at dawn for they would have been plucked off the plants and would be resting in a pot of water with people watching over it, willing it to flower. Onam was one of those festivals I used to love. I used to love (I still do) the creative aspect of the festival. 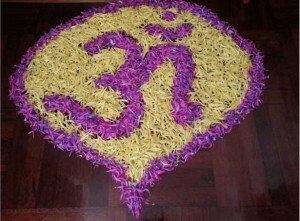 Onam entailed creating beautiful flower patterns at the doorstep. Every doorstep would be adorned with flowers and leaves, fusing together to form breathtaking patterns. The atmosphere would be charged with excitement. Kids would be running along the corridors, feasting their eyes on the flower decorations on each doorstep, automatically assigning “scores” to the flower decorations. In the midst of this mad running and dashing around, some aunties would call out and we would be treated to a cup of payasam, which was never refused and always welcome. These little bits and pieces kept wafting back into conscious memory when I was in the midst of a profusion of flowers and plants the other day. Childhood memories have their own distinct nostalgia, don’t they? As we grow up, there are certain bits and pieces of childhood that keep surfacing into our conscious mind, certain instances that leave us gasping and awed with their sheer clarity. For me, that day was one such when Onam celebrations from my childhood filtered through the recesses of my mind and made their presence felt. As I wandered around shopping for flowers, the thought did register in my mind that Macadamia and Pecan would never know the little pleasures of actually going looking for flowers in the wee hours of the morning and quite literally plundering the plants. They would never know what it is like to invite the ire and wrath of all the grandmothers if one was caught sneaking a flower home. Trust me when I say, going flower picking was nothing short of James Bondish. There were all the elements that make up a James Bond movie – the sneak, the thrill, the danger and the formidable enemy agents in the form of grandmothers. There were no guns but the daggers that the grandmothers could throw just with their stares would put James Bond and Q together, to shame. When Macadamia and Pecan came back from school, it was a joy to watch their eyes lighting up at the sight of all the flowers that were waiting – waiting for their young hands to turn them into a beautiful pattern in celebrating the vibrancy, the liveliness and the joie de vivre of the festival of Onam. What I could see in their eyes was barely concealed excitement, yet a quiet sort of anticipation. Everything, over the next two hours, revolved around making the flower decoration and in doing that, they unknowingly transported me back to my childhood days, yet again. There is a garden in every childhood, an enchanted place where the colours are brighter, the air softer and the morning more fragrant than ever again. As I sat with them, I helped them with the flower art a bit but for the most part, I just watched them as they enjoyed getting creative with the flowers. For some inexplicable reason, I felt strangely content. I realized I was re-experiencing this bit of my childhood days, this time through their eyes. My heart leapt every time they expressed their happiness over the way the pattern was taking shape, my mind soared and smiled every time I heard their easy laughter mingle and intersperse with their small talk. Little did they know that they had made my day and put things into a beautiful perspective. They provided and painted the canvass while my mind filled the little gaps and spaces with childhood memories of my own. Nostalgia can be a wonderful journey. Blissfully unaware of it themselves, children drag you back to your own childhood and make you relive moments of it and in doing so, they somehow make life come a full circle, they bring about a completeness to the whole picture, they help you transcend age barriers. If there is one wish I can have for parents the world around, may we always be able to revel in the warmth and splendour of a trip “down memory lane” with our children. May love abound and laughter ring through families, creating memories that the next generation can revisit and relive, later in life.